We first saw Dozer in an ad his caretakers had posted to find him a new home. In the picture he was lying on ice and snow with a heavy chain and padlock attached to his neck. Straw For Dogs reached out to his caretakers by offering a doghouse, food, and straw. The offer was accepted and we gathered supplies to bring to this dog’s aid. 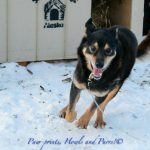 What we found was a very thin husky with a logging chain on his neck, a pile of frozen blankets in his doghouse, and an elderly female pit bull sharing his meager shelter and what little food was available. Their caretakers had run out of food several days before our visit. We gave both dogs food and water, chipped out the frozen blankets and stuffed the doghouse with straw. We were able to remove the chain and padlock from Dozer’s neck and replace them with a lightweight cable tie-out. The female, Macy Gray, was not chained. We were able to take both dogs into rescue the next day. Macy Gray, the pit bull, was adopted by a volunteer where she spent the rest of her life hiking, eating gourmet food, and enjoying soft beds and a yard to roam. Dozer, a gentle giant of a dog, was also adopted. He now spends his life enjoying living inside the home of his new family and going out for fun adventures. His new life has obviously agreed with him―this once thin dog put on 40 pounds in one year!